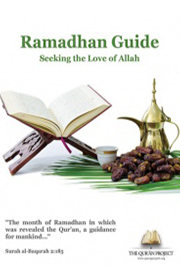 The Qur’an Project has published the ‘Ramadhan Guide’ – ideal in so many ways. You can download the FREE copy and also order your FREE copy. 3) Duas from the Qur’an, Duas seeking the Love of Allah [swt], Qunoot Duas and others. No single book can fully convey the many treasures that Ramadhan holds for a Believer. It is a time when one cuts himself off from worldly norms and renews himself to Allah [swt]-his Creator. He disciplines his mind, heart, hand, feet, tongue and stomach to act only in accordance to that which Allah [swt] loves. In the process the Believer’s Heart is cleansed and washed to its deepest and most innermost parts not from earthly water but from divine rain-the final revelation -The Qur’an. So if you want to prepare your self to maximise your time in Ramadhan – this is a must have!!!! Download, order your copy and SHARE with family and friends. We hope you benefit from this years Ramadhan Diary and share this with family and friends. May Allah Almighty forgive us for all our sins and shortcomings and bless us with the best Ramadhan of our lives [ameen].